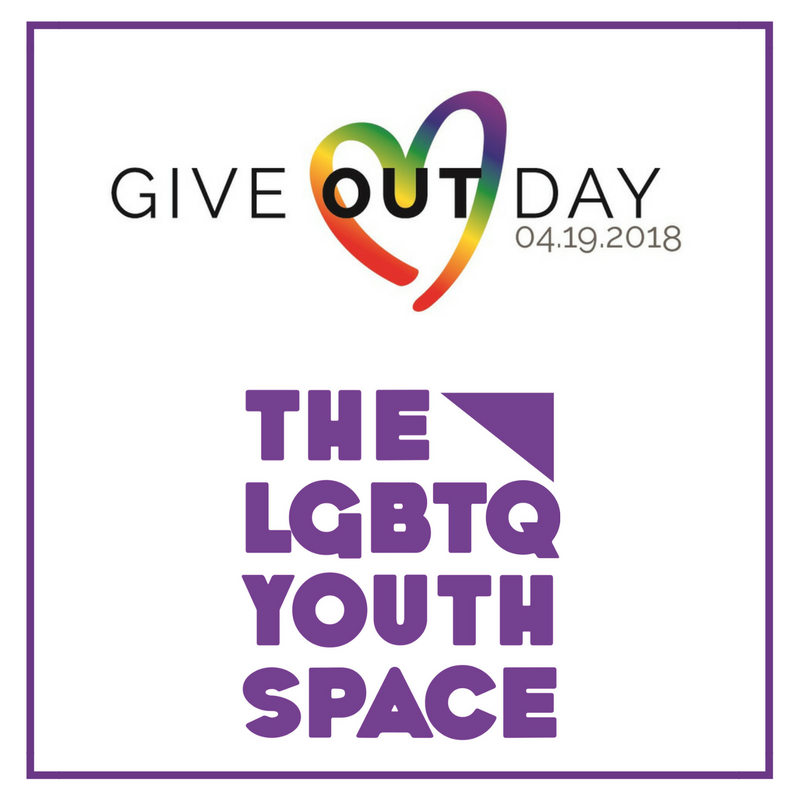 Our LGBTQ Youth Space, a program of our Family & Children Services division, is excited to participate in Give OUT Day, the only national day of giving for the LGBTQ community. The 24-hour online fundraising event unites the LGBTQ community from all 50 states and D.C. Give OUT Day 2018 takes place on Thursday, April 19, 2018. Last year, Give OUT Day raised over $750,000 to support LGBTQ nonprofits! Give OUT Day is a project of Horizons Foundation. Founded as a community foundation of, by, and for LGBTQ people, Horizons has been supporting LGBTQ nonprofit organizations, leaders, and donors for nearly 40 years. Throughout the day-long event, thousands of people make gifts to support a diverse array of LGBTQ nonprofits across the country, ranging from the arts to social services agencies, advocacy groups to sports leagues, community centers to health care nonprofits, and our own LGBTQ Youth Space. Counseling services are provided in English, Spanish, and American Sign Language (ASL). Psychiatric services are available, as needed. In addition to youth services, the program’s Speakers Bureau provides cultural competency presentations for youth-serving professionals, clubs and organizations, schools, and other interested audiences. Support the LGBTQ Youth Space and Give OUT Day here. On Sunday, colleagues from Caminar and The LGBTQ Youth Space joined other community leaders and members at the Bay Area Municipal Elections Committee (BAYMEC) Progress Never Stops brunch. BAYMEC, a four-county lesbian, gay, bisexual, and transgender (LGBT) political action committee (PAC), has lobbied and fought for LGBT civil rights and a more equal and inclusive society for 33 years. Held at The GlassHouse in San Jose, the brunch included networking with local elected officials and community leaders, the opportunity to meet candidates for public office, and a program of dynamic and inspiring speakers. An event highlight, the keynote address featured California Attorney General Xavier Becerra who received a standing ovation from the more than 400 in attendance. Our organization was well represented by Cassie Blume, Director of LGBT Programs, and Adrienne Keel, Outreach Coordinator, from The LGBTQ Youth Space and Harriet Pecot, Caminar’s Associate Director of Major Gifts. The LGBTQ Youth Space also staffed a table at the brunch and spoke with attendees about programs and services offered to LGBTQ youth in Santa Clara County. Proceeds from the event will help to elect LGBT candidates and champions of LGBT rights to local office in 2018. On Friday evening, we welcomed friends and supporters to our downtown San Jose LGBTQ Youth Space drop-in center for the Rainbow Social. The social celebrated our LGBTQ programs for youth and adults, highlighted how the programs are responding to growing community needs, and thanked our generous supporters. Our CEO, Chip Huggins, kicked off the evening by welcoming guests and emphasizing the great work the center does to address the need for a safe and supportive place for LGBTQ youth and individuals in the community. Chip then introduced Santa Clara County Supervisor Ken Yeager, a longtime LGBTQ Youth Space proponent, and LGBTQ advocate. Supervisor Yeager also remarked on the importance of the LGBTQ Youth Space and the services it provides to the community. He noted that the need for the program motivated his involvement in securing County funding to fund a portion of center operations through 2021. Supervisor Yeager spoke to the County’s commitment to the LGBTQ community. In 2016, the County of Santa Clara opened the Office of LGBTQ Affairs, the first in the nation at the county level dedicated to serving the LGBTQ community. As well, every weekday, the rainbow and transgender pride flags proudly fly at county offices. Cassie Blume, the Director of LGBTQ Programs, expressed gratitude to Supervisor Yeager for his unwavering support of, and deep commitment to, the work of the LGBTQ Youth Space. She then spoke quantitatively of the reach of the LGBTQ Youth Space. Over 4,500 individuals were served at the center in the last year—including dreamers, homeless youth, those needing health and wellness care, foster youth, and young adults with few other places to turn. And, an additional 8,400 people were touched through outreach and education programs in the community, including the Youth Speakers Bureau. The multigenerational LGBTQ Wellness program reached close to 1,000 people through its peer support, mental health advocacy, and outreach and education activities. Cassie emphasized that this work is made possible by the compassion and generosity of donors, and expressed appreciation to all the donors in attendance. Forest, a non-binary youth whose pronouns are “they/them,” then shared an inspiring and thoughtful story of how the program transformed their life. Forest spoke eloquently about the loneliness and isolation felt upon realizing they were different than peers, yet the feeling of immediate belonging upon finding our LGBTQ Youth Space. Hope, Forest said, is the greatest thing the program offers to the community. Denise, Forest’s mom, spoke of how the program helped her; it provided her the opportunity to connect with other parents of non-binary youth and helped to better understand and deepen her connection with her child. The remarks concluded with a lovely song on a rainbow-painted ukulele by an LGBTQ Youth Space participant. We were thrilled so many of our friends joined us for this special evening. In addition to Supervisor Yeager taking time from his busy schedule to celebrate with us, several representatives of faith-based communities attended, as did representatives from the business community, including PwC and Silicon Valley Business Journal. We are especially thankful to PwC and Vivienne and Moez Virani for their generous underwriting of the evening. LGBTQ Wellness and The LGBTQ Youth Space are programs of Family & Children Services of Silicon Valley (FCS), a division of Caminar.